Direct, immediate access to your team 24x7x365. Yes, that means no frustrating automated menus when you call. From deep strategic planning to reacting to an emergency at 3 a.m., Penta Servers are ready to help. When you call Penta Server, you don't have to fight to speak to someone who can solve your problem. We've got more Red Hat certified engineers than any other hosting company. And the list of certifications goes on. Our customers regularly change their configurations as their needs change. We offer the right solution at the right time. 100% power. 100% network uptime. One hour hardware replacement guarantee for hardware failure. And that's the minimum. Penta Server is committed to open standards. That's why we launched OpenStack®, the cloud's open source operating system. If we fail to meet our contractual obligations and we can't make it right, you can leave. Stay because you want to, not because you have to. We don't use scripts to solve problems; we use our brains. Our customers deserve more than a canned script. We'll help you find the best solution for you, not just for us. If you end up spending less, that's great! 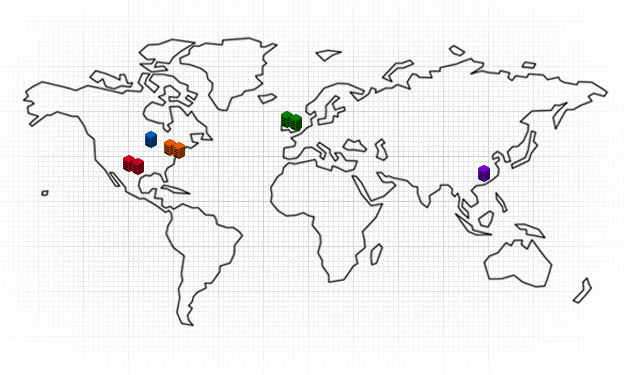 Penta Server® Hosting services are supported by eight (8) data centers located in the U.S., the UK and Hong Kong—to serve global customer needs. Every data center employee undergoes multiple and thorough background security checks before they're hired. Every data center's HVAC (Heating Ventilation Air Conditioning) system is N+1 redundant. This ensures that a duplicate system immediately comes online should there be an HVAC system failure. Should a total utility power outage ever occur, all of our data centers' power systems are designed to run uninterrupted, with every server receiving conditioned UPS (Uninterruptible Power Supply) power. Only fully redundant, enterprise-class routing equipment is used in Penta Server data centers. Fiber carriers enter our data centers at disparate points to guard against service failure.